PRODUCT DESCRIPTION: This is a glandular lure which is derived from the scent glands found on bobcats from the United States. These scent glands are used to mark territories, dens, food mounds, dominance, etc. 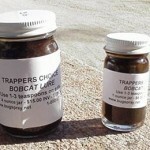 WHERE TO USE IT: Can be used at most trap sets being made for bobcat which includes the list above. 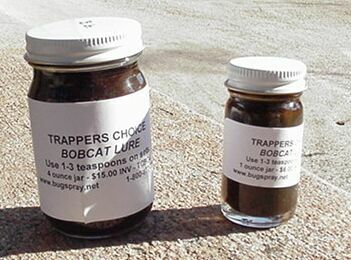 By using the lure you are able to make a set and give it the appearance another bobcat is actually doing the work. This will cause the targeted bobcat to either be interested or to make a mistake and lower it's guard causing it to get caught by your set. RATE OF APPLICATION: A teaspoon is usually enough to use for any one set since this scent is highly concentrated. Do be careful where you apply it since there are several trap sets which do not require the use of this lure. Details for such sets can be found in the handbook we sell.